Mobile payments refer to payment services performed from or via a mobile device. Such payments are also routinely referred to as mobile money, mobile money transfer or mobile wallet and present themselves as an alternative to cash, check or credit card payments. A growing phenomenon in developed markets, mobile payments have been especially successful in developing markets where previously underbanked consumers have been able to take advantage of new mobile infrastructures to improve their financial standings. Furthermore, use of non-traditional paying methods for goods and services is not only dependent on the geographical location of the payee, but also on variables such as age, education and economical background. In the United States, the typical user of mobile paying methods is between 30 and 44 years old , is college-educated and has an above-average yearly salary. The four primary models for mobile payments are premium SMS, direct mobile billing, web based payments (including apps) and contactless NFC. In the United States, the majority of mobile payments were still connected to debit or credit card usage. Only 15.4 percent of mobile payment users utilized designated online wallets such as PayPal or Google Wallet and only 4.2 percent used carrier billing. The most popular uses of mobile payment services is making purchases , followed by paying bills and online purchases. According to a 2016 consumer survey, another attractive feature of mobile payment technologies for consumers in the United States was be the ability to use one’s phone to stop unauthorized payment transactions. The awareness regarding digital payment methods, such as the mobile wallet, or specific payment services such as PayPal, Apple Pay, or Google Wallet grows steadily. As such, the consumer intention to use mobile payments for daily routine transactions such as café or grocery store visits also increases. The most popular mobile wallets accessed in-store by U.S. users as of December 2017 were Apple Pay and PayPal. Most recent mobile wallet users had a very good or excellent usage experience, prompting an increased likelihood of using their mobile wallets in-store again. Retailers and SMBs have taken advantage of the situation and increasingly offer mobile payment methods during checkout. 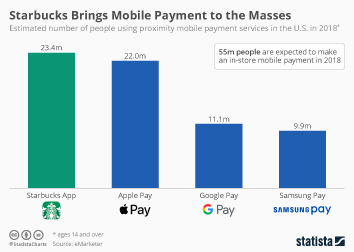 As of December 2017, the leading mobile payment platform accepted by North American retailers were Apple Pay and PayPal, followed by Android Pay. More interesting topics from the industry "Digital Payments"